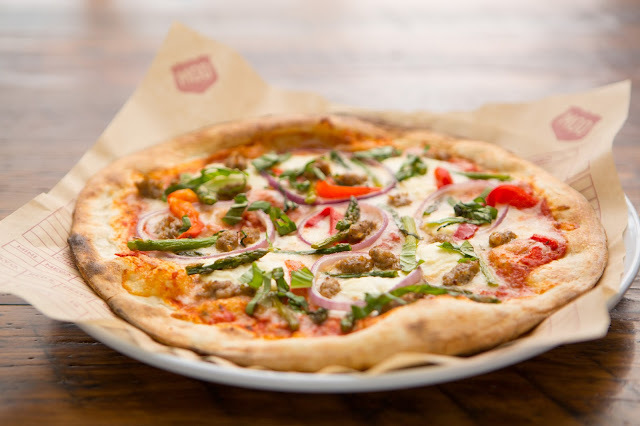 MOD Pizza just opened its seventh Chicago-area location last month. The restaurant chain, with more than 125 locations nationwide, is the pioneer of fast casual pizza and allows guests to build their own creations from more than 45 sauce, cheese and topping options – all for one price. A new variety, the Cooper (pictured below), is an artisan-style pizza tailor-made for spring that features seasonal roasted asparagus along with red peppers, Italian sausage, red onion, ricotta and mozzarella cheeses and fresh basil. It's available through June 30. In addition to the Cooper, guests can order any one of MOD’s nine classic, handcrafted and custom-made pizzas or build their own creation choosing from more than 45 signature sauce, cheese and topping options – all for one price. MOD also offers salads, milkshakes, fresh-brewed iced teas, lemonades and local craft beer and wine, where available. So, how would you like to give MOD Pizza a try? Enter below for a chance to win 5 certificates for a free pizza valued at $50. The Cooper sounds really yummy, but I'm always partial to mushrooms on my pizza. MOD Pizza has created a buzz around town. The new location is highly visible (right on Washington Street) and Napervillians are excitied to try this new place. I'm looking forward to my chowing down my first pizza from here. I'll build my own with my favorite toppings: Spinach, garlic and fresh tomato. Mmmm! --Can't wait!